Pierre Thévenin, born into a family of musicians, was a gifted cellist in addition to being a noted painter. He studied art at the School of Fine Arts in Lyons and first exhibited his paintings in the Salon du Sud-Est in 1928. 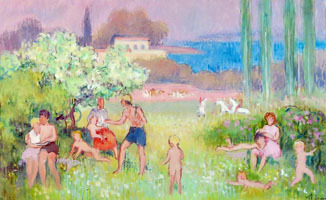 At this period in his life, he painted in his studio in the town of Mougins on the Côte d’Azur and his paintings were strongly influenced by the warm Mediterranean climate, the brilliant light, and the exotic vegetation of the south of France, all of which are reflected in the warm and startling colors of his landscapes and portraits. He was strongly influenced by the works of both Derain and Matisse. While working seriously as a painter, he was also a member of the Orchestra of the Opéra of Lyons and played with an instrumental quintet. In 1932, he set off to visit even more exotic places by playing as a professional musician on cruise ships. Thus he was able to see and paint India, Indochina, Japan, China, and Madagascar. Later, he also followed in the footsteps of Matisse and Delacroix in Morocco. His visit there led to a commission for a Moroccan postage stamp, and on his return to France, the City of Lyons purchased his painting:The Arab Street of Fez. In September of 1996 an exhibition of drawings, watercolors, pastels, and oils on paper by Thévenin was held at the Mazarini Gallery in Lyons. References: Bénézit, Dictionnaire des Peintres, Sculpteurs, Dessinateurs et Graveurs (1999). Riva, Fabrice, Trois Cents dessins, aquarelles, pastels, et huiles sur papier par Pierre Thévenin (1905-1950), (catalogue of the exhibition), Mazarini, Lyons, 1996.